Up to this tutorial, we focused on the Node class in Godot as that’s the one you use to code behavior and most of the engine’s features rely on it. There is another datatype that is just as important: Resource. Nodes give you functionality: they draw sprites, 3D models, simulate physics, arrange user interfaces, etc. Resources are data containers. They don’t do anything on their own: instead, nodes use the data contained in resources. Anything Godot saves or loads from disk is a resource. Be it a scene (a .tscn or an .scn file), an image, a script… Here are some Resource examples: Texture, Script, Mesh, Animation, AudioStream, Font, Translation. When the engine loads a resource from disk, it only loads it once. If a copy of that resource is already in memory, trying to load the resource again will return the same copy every time. As resources only contain data, there is no need to duplicate them. External to a scene, saved on the disk as individual files. Built-in, saved inside the *.tscn or the *.scn file they’re attached to. Clicking the resource preview allows us to view and edit the resource’s properties. The path property tells us where the resource comes from. In this case, it comes from a PNG image called robi.png. When the resource comes from a file like this, it is an external resource. If you erase the path or this path is empty, it becomes a built-in resource. The switch between built-in and external resources happens when you save the scene. 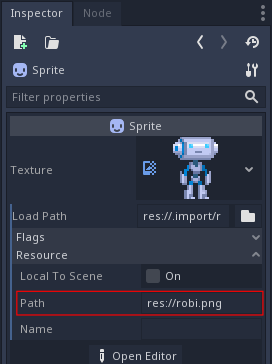 In the example above, if you erase the path `”res://robi.png”` and save, Godot will save the image inside the .tscn scene file. Even if you save a built-in resource, when you instance a scene multiple times, the engine will only load one copy of it. var res = load("res://robi.png") # Godot loads the Resource when it reads the line. var texture = (Texture)GD.Load("res://robi.png"); // Godot loads the Resource when it reads the line. You can also preload resources. Unlike load, this function will read the file from disk and load it at compile-time. As a result, you cannot call preload with a variable path: you need to use a constant string. // 'preload()' is unavailable in C Sharp. Scenes are also resources, but there is a catch. Scenes saved to disk are resources of type PackedScene. The scene is packed inside a resource. To get an instance of the scene, you have to use the PackedScene.instance() method. This method creates the nodes in the scene’s hierarchy, configures them, and returns the root node of the scene. You can then add it as a child of any other node. The approach has several advantages. As the PackedScene.instance() function is fast, you can create new enemies, bullets, effects, etc. without having to load them again from disk each time. Remember that, as always, images, meshes, etc. are all shared between the scene instances. When a Resource is no longer in use, it will automatically free itself. Since, in most cases, Resources are contained in Nodes, when you free a node, the engine frees all the resources it owns as well if no other node uses them. Like any Object in Godot, users can also script Resources. Resource scripts inherit the ability to freely translate between object properties and serialized text or binary data (/.tres, /.res). They also inherit the reference-counting memory management from the Reference type. They can define constants, so constants from other data fields or objects are not needed. They can define methods, including setter/getter methods for properties. This allows for abstraction and encapsulation of the underlying data. If the Resource script’s structure needs to change, the game using the Resource need not also change. They can define signals, so Resources can trigger responses to changes in the data they manage. They have defined properties, so users know 100% that their data will exist. Resource auto-serialization and deserialization is a built-in Godot Engine feature. Users do not need to implement custom logic to import/export a resource file’s data. Resources can even serialize sub-Resources recursively, meaning users can design even more sophisticated data structures. Users can save Resources as version-control-friendly text files (*.tres). Upon exporting a game, Godot serializes resource files as binary files (*.res) for increased speed and compression. Godot Engine’s Inspector renders and edits Resource files out-of-the-box. As such, users often do not need to implement custom logic to visualize or edit their data. To do so, double-click the resource file in the FileSystem dock or click the folder icon in the Inspector and open the file in the dialog. They can extend other resource types besides just the base Resource. Resources and Dictionaries are both passed by reference, but only Resources are reference-counted. This means that if a Dictionary is passed between objects and the first object is deleted, all other objects’ references to the Dictinoary will be invalidated. Conversely, Resources will not be freed from memory until all the objects are deleted. obj2.dict = obj1.dict             # 'obj2.dict' now references 'obj1's Dictionary. obj1.free()                       # 'obj1' is freed and the Dictionary too! print(obj2.dict.greeting)         # Error! 'greeting' index accessed on null instance! # To avoid this, we must manually duplicate the Dictionary. obj2.dict = obj1.dict.duplicate() # Now we are passing a copy, not a reference. obj1.free()                       # obj2's Dictionary still exists. 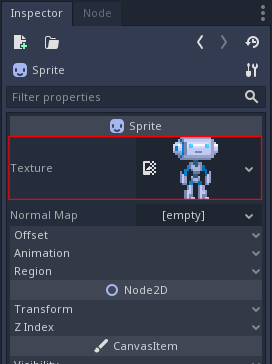 Godot makes it easy to create custom Resources in the Inspector. Create a plain Resource object in the Inspector. This can even be a type that derives Resource, so long as your script is extending that type. Set the script property in the Inspector to be your script. The Inspector will now display your Resource script’s custom properties. If one edits those values and saves the resource, the Inspector serializes the custom properties too! To save a resource from the Inspector, click the Inspector’s tools menu (top right), and select “Save” or “Save As…”. If the script’s language supports script classes, then it streamlines the process. Defining a name for your script alone will add it to the Inspector’s creation dialog. This will auto-add your script to the Resource object you create. # Uses an implicit, duck-typed interface for any 'health'-compatible resources. 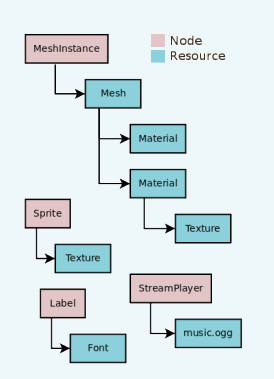 Resource scripts are similar to Unity’s ScriptableObjects. The Inspector provides built-in support for custom resources. If desired though, users can even design their own Control-based tool scripts and combine them with an EditorPlugin to create custom visualizations and editors for their data. Unreal Engine 4’s DataTables and CurveTables are also easy to recreate with Resource scripts. DataTables are a String mapped to a custom struct, similar to a Dictionary mapping a String to a secondary custom Resource script. "GodotBot": BotStats.new(10), # Creates instance with 10 health. "DifferentBot": BotStats.new(20) # A different one with 20 health. _stats["GodotBot"] = new BotStats(10); // Creates instance with 10 health. _stats["DifferentBot"] = new BotStats(20); // A different one with 20 health. Design a visualization within the editor and create a simple plugin that adds it to the Inspector when you open these types of Resources. CurveTables are the same thing, except mapped to an Array of float values or a Curve/Curve2D resource object. Beware that resource files (*.tres/*.res) will store the path of the script they use in the file. When loaded, they will fetch and load this script as an extension of their type. This means that trying to assign a subclass, i.e. an inner class of a script (such as using the class keyword in GDScript) won’t work. Godot will not serialize the custom properties on the script subclass properly. In the example below, Godot would load the Node script, see that it doesn’t extend Resource, and then determine that the script failed to load for the Resource object since the types are incompatible. # This will NOT serialize the 'value' property. // This will NOT serialize the 'Value' property.